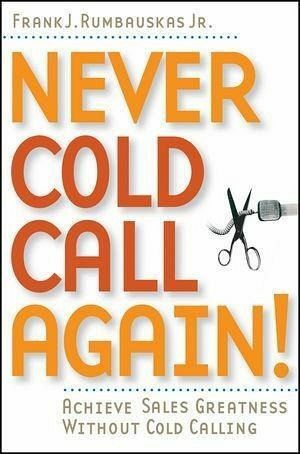 Never Cold Call Again offers practical, step-by-step alternatives to traditional cold calling for salespeople, small business owners, and independent professionals who are actively building a client base. The Information Age presents endless opportunities for finding leads without cold calling. In fact, Frank Rumbauskas's system brings prospects to the salesperson, rather than the other way around. Readers will find unbeatable sales advice on effective self-promotion, generating endless leads, how to win prospects using e-mail, prospecting on the Web, networking, developing effective proposals, and much more. GENERATE MORE LEADS AND HIGHER SALES-WITHOUT COLD CALLING! Salespeople everywhere are learning the hard way that cold calling just doesn't work anymore. Yet, millions of salespeople are stuck in the past, using twentieth-century sales techniques to try to lure twenty-first-century customers. But today's consumers have no patience for the sales pitch-that is, if they even answer the phone at all. There has to be an easier way to find more and better prospects-and there is. Today's most successful salespeople are using modern technology to bring prospects to them, rather than fishing for prospects over the phone. In Never Cold Call Again, Frank Rumbauskas shows you how to move your sales program into the Information Age using modern marketing tools like e-mail, Web sites, and blogs. Based on interviews with top performers, proven marketing tactics, and his own sales experience, Rumbauskas shows you how to make more money in sales without the high-pressure tactics and closing speeches everyone is sick of. This cutting-edge guide will bring your sales methods into the future, without the cold call. Plus, you'll learn how to: * Craft a unique message and get it out to the masses * Use e-mail to land prospects you wouldn't get over the phone * Use direct mail techniques that still work * Build a Web site and drive traffic to it * Maintain ongoing contact with prospects * Use newsletters to get the word out * Write a blog to attract qualified prospects automatically * Get free publicity from the media * Think like an independent consultant, not a sales rep * Develop and deliver a powerful sales proposal Cold calling isn't just ineffective; it's outdated. Never Cold Call Again will show you how to tap into the power of modern marketing to increase your prospects and boost your sales-without even picking up the phone! Frank J. Rumbauskas Jr. started his sales career cold calling to no avail, failing to make his numbers, only to receive the useless advice of "increase your activity" from managers. He then went into a trialand-error period of several years and developed a complete system of selling that made him a top producer without cold calling. 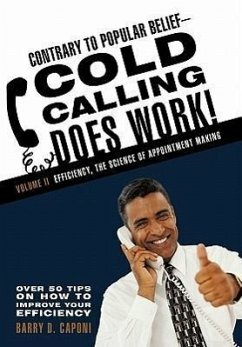 Author of the self-published sensation Cold Calling Is A Waste Of Time, Frank lives in Phoenix, Arizona, where he is a partner in several businesses including an insurance agency, a telecom services provider, and, of course, his sales training company, which strives to educate all salespeople that there are much better ways to prospect than cold calling. Frank's blog can be found at nevercoldcall.typepad.com.